Union Minister for HRD Smriti Irani is again in the midst of controversy and is facing criticism. The reason is her plan to teach Sanskrit in Indian Institutes of Technology (IITs). The proposal has met with ridicule, as Sanskrit, an ancient language of the priestly class among Brahmins, has never been a spoken language in India. Yet, comes the bizarre proposal from the Human Resources Development Ministry. The population that can speak the language is minuscule and comprise mostly of Brahmin priests or students in Sanskrit colleges but even proficiency of the few thousands who claim to speak, is doubtful. Twitterati reacted with shock. Many made fun of the proposal. However, there were some who wanted it to be revived as it is an ancient language and is considered to have an influence on other living languages. The social media reaction on Facebook was equally unsparing. The reason is that Sanskrit was used by Brahmin priestly class and was never a spoken language among masses. Even the priestly class didn't use it for conversation in ancient era, when Prakrit was the language of communication. The lower caste were not allowed to even learn the language and there was strict punishment for the 'crime'. 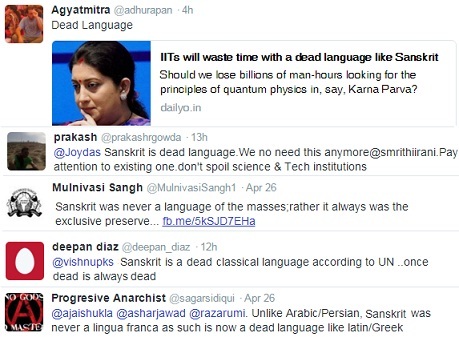 However, right-wing Hindutva groups have been proponents of the ancient language. HRD ministry has invited flak for several decisions in recent months. "Teach nuclear physics to students literature", wrote a Facebook user, to express his outrage over the proposal.